Mirador is a great villa for a family or four couples who want to be as close to the beach as possible. It has tons of outdoor space, lounging and dining for large groups, and a surprising amount of privacy considering its convenient location. Beachfront villa within walking distance to restaurants! 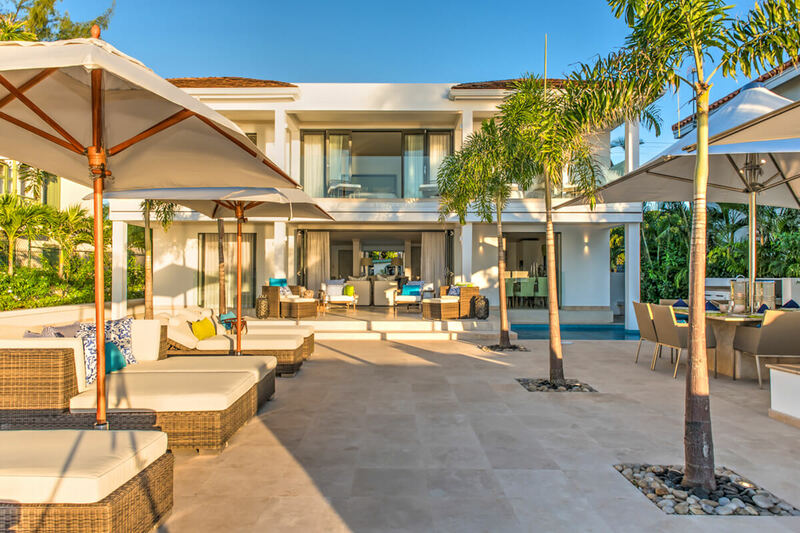 Mirador is a chic, four-bedroom villa on Barbados’ West Coast. This beachfront property has direct access to the sea and lush palm trees surround three sides for privacy. A short staircase leads down to the beach, where guests can swim in the turquoise waters and watch sailboats drift by. The villa’s deck is more private and has double loungers, umbrellas, and a night-lit pool. There’s plenty of space for large family dinners thanks to multiple dining tables and a gas BBQ grill. Another lounge area sits above the pool and leads into the main living room. Mirador’s living room and kitchen both open seamlessly to the terrace and enjoy ocean views. The living room has a full entertainment center with a flatscreen TV and shares space with the dining table and kitchen. The kitchen has a bar, wine cooler, and stainless steel appliances. WiFi runs throughout the space. The villa is staffed with a butler, chef, housekeeper, and a night watchman. There are four spacious bedrooms with ensuite bathrooms and air-conditioning. The master suite and two of the guest suites open to the balcony, which overlooks the pool terrace, gardens, and Caribbean Sea through a glass barrier. Upstairs, there are two king suites and a twin suite that can be made up as a king, and on the main floor there’s a king suite. Mirador is within walking distance to restaurants, bars, a supermarket, and a doctors’ office. It’s also a short drive to LimeGrove Lifestyle Centre’s shops and movie theater. Upon arrival guests will secure their rental vehicle and drive to the villa using directions provided.